Kansas City, Missouri, USA. The Aquarian Organization of Astrologers Kansas City (AOA) was started in 1973. 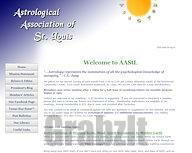 The AOA's mission is to provide service to the Kansas City community of astrology enthusiasts. The AOA offers opportunities for its members to come together and make new friends, learn and grow together. Glasgow, Scotland. 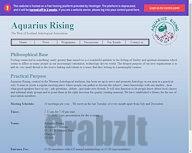 Aquarius Rising, centred in the western astrological tradition, has been set up to serve and promote astrology in our area in a practical way. It aims to create a regular meeting place where people can gather to discuss the subject, share knowledge with one another, hear what good speakers have to say, ask questions, debate, and make new friends. It will also function to let people know about local classes and informal study groups and to point them in the right direction for quality reading material. We have established a library for the use of association members. Cheltenham, United Kingdom. Since 1981, Aquarius Severn has provided a forum for astrology and related subjects, encouraging exchange of ideas, learning and an exploration of the nature and meaning of astrology. Zurich, Switzerland. Der ASTRO-CLUB ZÜRICH setzt sich zum Ziel, den an Astrologie Interessierten eine Möglichkeit zum Gedankenaustausch und zur Weiterbildung anzubieten. Dabei ist der Verein an keine bestimmte astrologische Schule oder Betrachtungsweise gebunden. Gerade die Vielfältigkeit der Herkunft des astrologischen Wissens unserer Vereinsmitglieder führt zu interessanten Diskussionen. Das astrologische Wissensspektrum unserer Mitglieder reicht von Anfänger/-innen bis zu professionellen Berater/-innen. St. Louis, Missouri, USA. We gather on the second Sunday of each month from 2:00 to 5:00 pm (unless otherwise noted) at the Brentwood Community Center: 2505 South Brentwood Boulevard, St. Louis, MO 63144. Attendees may arrive anytime after 1:30pm for a half-hour of socializing before our monthly program begins at 2pm. London, United Kingdom. Founded in 1915 by Alan Leo for the study of astrology, the Lodge provides a weekly focus for a dynamic and lively community of astrologers. Austin, Texas, USA. The Astrological Society of Austin (ASA) is dedicated to building community through the promotion of the study of astrology in Central Texas. Hartford, Connecticut, USA. The Astrological Society of Connecticut was founded October 17, 1972, in Hartford, Connecticut. The ASC is a non-profit organization, dedicated to educating people interested in astrology. Since its inception in 1972, the ASC has grown to become one of the largest and most active local astrological organizations in the United States. Louisville, Kentucky, USA. 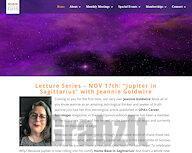 Our goal is to increase community understanding of astrology through lectures, workshops, discussions and research. Fort Worth, Texas, USA. The Astrological Society of North Texas is one of the longest-lived astrological groups in the nation. Founded in 1972, it was incorporated as a non-profit in 1984. 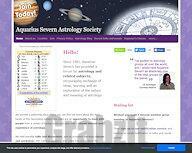 The basic mission is to be a source of education to our community about astrology. Princeton, New Jersey, USA. 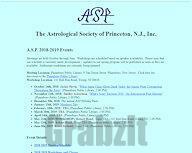 The Astrological Society of Princeton was founded in 1972 to provide opportunities for the advancement of astrology by means of regular meetings, lectures, classes, and publications. Currently, the Society holds regular monthly meetings, bringing to the Princeton area a variety of nationally and internationally known speakers. An active educational program offers classes and workshops given by the faculty of A.S.P. and by distinguished guests. Drummoyne, New South Wales, Australia. 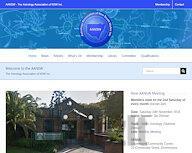 The Astrology Association of NSW Inc is an incorporated not-for-profit association that aims to encourage cooperation and contact between astrologers. To further this aim the AANSW arranges seminars, meetings, conferences and other activities to enable discussion of issues in astrology. Toronto, Ontario, Canada. 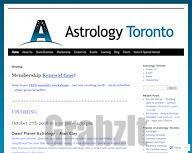 Astrology Toronto seeks to educate and promote research in astrology; raise the level of knowledge, insight and professional competence among our members; further public understanding of astrology; facilitate communications between AT and other astrological organizations; foster the sharing of astrological resources and information. Baltimore, Maryland, USA. We are a chapter of The National Council for Geocosmic Research (NCGR) whose mission is to build community through astrological research and education. We focus on education and self-awareness through lectures and workshops. Bath, United Kingdom. Bath Astrologers' Forum is a society of West Country astrologers whose aim is to exchange ideas and raise the debate about the philosophical foundations of astrology through the study of astrological charts both past and current. We hold talks and seminars regularly on the first Monday of every month at Waterfront House in Bath. 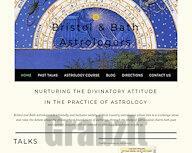 Anyone with an interest in astrology is welcome to join us. Denver, Colorado, USA. 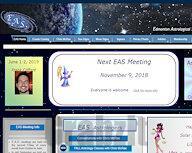 The Denver Astrology group is a local astrological organization that holds meetings each month in Denver, Colorado. Meetings are always held on the second Saturday of each month from 3:00 PM to 5:00 PM at the Mercury Cafe, which is located at 2199 California Street. Edmonton, Alberta, Canada. E.A.S. meetings are held on the second Friday of every month from October to May. In mid-June and September we hold our annual astrological weekends. Our meetings are open to members and guests. First-time guests are admitted free, subsequent attendance is $5.00 per person. Shared experience and learning at every level of astrological expertise has long been the hallmark of these informal meetings. We welcome new members. Perth, Western Australia, Australia. 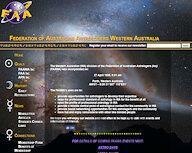 The FAAWA's aims are to provide opportunities for astrologers to develop their expertise; raise the professional standard of astrology in WA for the benefit of all; raise the profile of professional astrology in WA; provide a reliable central point of astrological contact for the community in WA; provide social networking opportunities for WA astrologers and the community; have fun and enjoy camaraderie with other like-minded people. Vancouver, British Columbia, Canada. 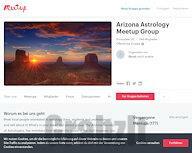 The Guild is formed of a group of people interested in astrology and talking with like-minded individuals. Some of us are professionals in the field, others students and hobbyists. Everyone is welcome to attend our talks and workshops. Chicago and Oakbrook, Illinois, USA. Come meet our Chicagoland Astrology group! We offer educational lectures TWICE a month. Meetings start at 7:30 PM are at the following locations: Midwest Plaza South, 2021 Midwest Road, OAKBROOK, IL 60523, lower level; and Irish American Heritage Center, 4626 N. Knox Avenue, CHICAGO, IL 60630, Room 304, on the 3rd floor. Houston, Texas, USA. 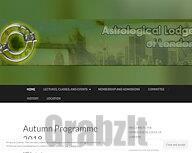 An organization for the promotion, education and study of astrology. We are comprised of teachers, students, researchers and seekers. There are bi-monthly meetings including a guest speaker as well as information on classes, workshops and conferences. Cleveland, Ohio, USA. 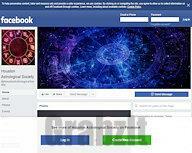 This is a group for friends of astrology of all levels - from the merely curious to the practicing professional. Founded by Ena Stanley, Richard Smoot, and Julene Packer-Louis. Holds regular social events, classes, and workshops. Atlanta, Georgia, USA. The Society is open to everyone interested in astrology. 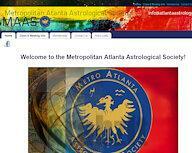 Our membership includes professionals, beginners, serious students and those who are simply interested in astrology. M.A.A.S. meets on the third Saturday of each month at 12 Noon at Harobi House. At our meeting, we have a lecture or panel discussion presented by a different speaker each month on a wide variety of specialized subjects related to astrology. Various locations worldwide. The National Council for Geocosmic Research (NCGR) is organized into a large number of local chapters around the world. 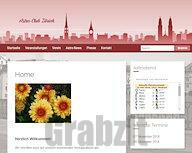 This page allows you to find a chapter in your area.